Yeah, but: Chicken Little eat your heart out. The Long Version: I enjoy planning. I like to know what to expect, and I like to have some idea what to do if that's not what happens. One manifestation of this is that I really want to know if it's likely to rain. Rain Alarm is a useful little application for iOS. 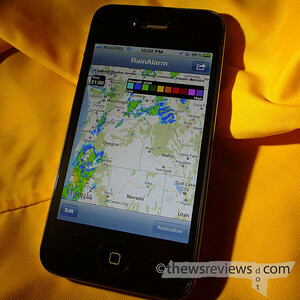 It taps into publicly-available weather radar and watches for precipitation around the phone's location; both the radius and the excitability of the program can be selected from its settings menu. It then ties into the Notification Center in iOS5 for messages that read "Precipitation about 5.2 km away (strength 30 of 100, area 4 of 100)". The application also shows the weather radar, and can animate the maps, making it easy to see exactly what's coming and how far away it is. So it's goodbye to that charming forecast "50% chance of scattered showers" that sounds significant but is short on specifics. By using Rain Alarm for the past month I've been able to make better choices about when to bike to and from work, and when I'll need an umbrella versus getting by with a hat. By paying attention to the program as well as the actual weather outside my window, I've learned how to interpret the programs's strength ratings and choose the gear that I need to cope with it. Yes, I'm still caught unprepared sometimes, but that's really just part of the fun of being obsessive. The reason why I bought an iPhone – aside from all of the accessories to dress it up in – is because I wanted a portable computer. 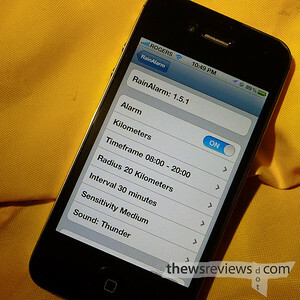 Clever applications like Rain Alarm, that can use the phone's on-board sensors to pull useful information out of a data stream, are exactly what these things are good for. It's a fairly simple task, but it's done well. There's something similar with the exact same name in the Android Marketplace. It even has the exact same icon. It is not the same app. The author of this app is Michael Diener, not Carlos Aviles. It's free, because it's ad-driven. I hate ad-driven apps because the ad takes up valuable screen realestate, and they look like crap. I also dislike an app that for all intents in purposes is an obvious rip-off of another app. And to add insult to injury, it operates poorly if at all. If this were a proper review it would get a 2/1. It mentions the iPhone app directly, saying it's "by" Carlos. It's obviously an approved port of the Android app. (And if you hate ads, buy the 'pro' version, sheesh). I work in construction and this would help so much. Unfortunately I am forced (literally :( ) to carry a BB. We have not been enlightened yet. Will find out if this works on an iPad, which I have but unfortunately to this day is wireless.